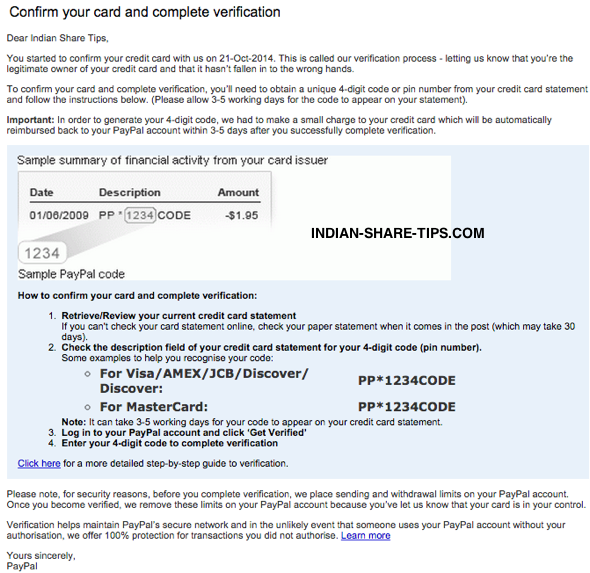 How to Confirm Debit or Credit Card in Paypal? Paypal is going to be a part of our life and thus one need to know the procedure of confirming the debit card or credit card with Paypal. The said process for confirmation has been explained in the below screenshot which is self explanatory. You can get the code being asked through ATM machine by printing the last 10 transactions or by seeing it online in the statement or you get it in your mobile as a transaction alert. Subscribe for our stock tips in email and make money like professionals.